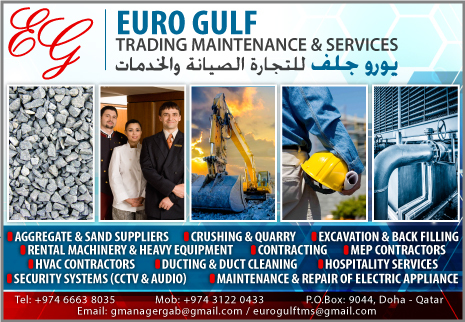 Founded in July 2016, EURO GULF TRADING MAINTENACE AND SERVICES provides general contracting, earthworks, stone crushing, hospitality services, HVAC systems, Heavy equipment rental and services, Air condition and other electrical appliances maintenance and repair services, trading of materials and CCTV and security systems throughout QATAR. Anchored by loyal employees which is 80% where all Filipinos who are dedicated to providing superior service, and grounded in the philosophy that honesty and integrity are as important as bottom line, our group has undertaken many challenging projects and accumulated skills, know-how and experiences in design and build solutions, project management services, building trades and related engineering works. Our objective is to satisfy our clients. Our emphasis on clear communication and follow-through procedures ensures that client’s objectives are top priority in the planning and execution of all our processes. We take pride in our projects, thus our clients can always be assured that only the most experienced and qualified people are serving them, all the time. To safely deliver a high-class quality MEP projects and Infrastructure projects on time and promoting environmental protection and sustainable communities’ development. To be one of the best MEP construction company at delivering large-scale, technically complex and demanding time-frame projects. Offering the highest standards of quality and reliability.